Banff, Canada, and the Canadian Rockies offer the most visually stunning wedding locations of any destination in the world. A wedding in Banff National Park will certainly be one to remember for both you, your spouse, and your guests. Just imagine a wedding with beautiful Lake Louise in the background, or perhaps feeling the warm embrace of that special someone on top of a mountain after you were swept to the top in a helicopter. And then retire to your cozy, romantic boutique hotel, or bask in the luxury of a five-star resort hotel. The power and tranquility of the mountains, lakes, and alpine meadows in and around Canmore, Banff and Lake Louise provide the most awe-inspiring environment, ensuring your wedding will last in your memories for a lifetime. When it comes time to make that commitment to each other, enjoy the moment in the Canadian Rockies, Banff National Park and Lake Louise. 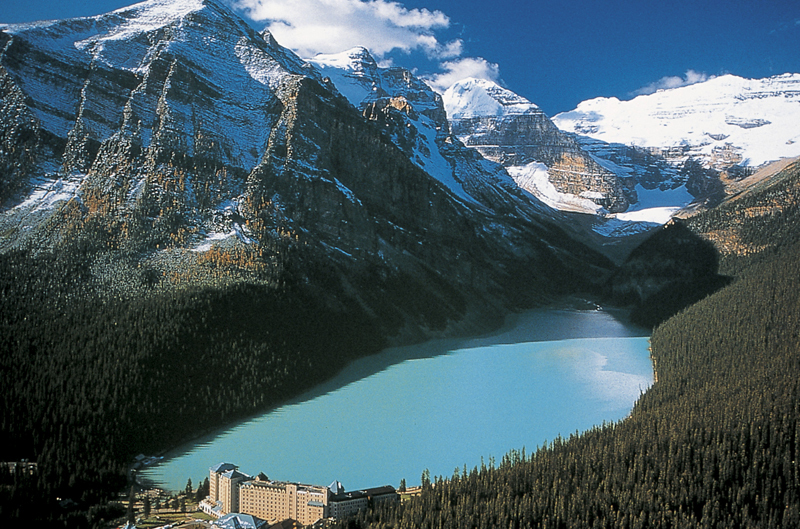 Banff National Park – From Canmore to Lake Louise, We’ve Got the Best Locations! Canmore, Alberta — Located in the heart of Western Canada’s Rocky Mountains, Canmore is as convenient of a weddings destination as it is scenic. Only 75 minutes from Calgary International Airport, Canmore is a vibrant town that has an eclectic mix of real Canadian residents and tourists. Canmore is more of a “real” town, you might say, in comparison to Banff and Jasper, which rely heavily on tourism. Here you can find local pubs and true local restaurant flavor, as well as off-beat shopping. Many repeat travelers often lodge and stay in Canmor’s hotels and resorts, since it is so close to Banff. Banff, Alberta – Canada’s first national park is famous for its natural hot springs and magnificent mountain landscape. As such, Banff is a photographer’s paradise – and a mountain bikers paradise, a hiker’s paradise, a skier’s paradise, a bird-watcher’s paradise, a kayaker’s paradise – you get the idea. But it’s also a luxury-lover’s paradise. Whatever accommodations you prefer – a rustic lodge, a boutique hotel, or world-class resort, it’s here in Banff. The town is located only one-and-a-half hours from the Calgary International Airport and thirty minutes west of Canmore. Lake Louise, Alberta – This small mountain community is framed by stunning mountains, breath-taking glaciers and beautiful turquoise waters. Smaller and consequently less developed than either Banff or Canmore, Lake Louise is one of the most famous backdrops for weddings. This lakeside village is quiet, but with its world-class accommodations it is perfect for an intimate wedding in an outdoor paradise. Lake Louise is Located two hours west of Calgary on the Trans Canada Highway/Highway 1 – on the way you will pass by both Canmore and Banff. Transportation services are plentiful and easy from Calgary to most areas around Banff and Banff National Park. Ground connections to Canmore, Banff and Lake Louise include shuttle service, limousines and rental cars. You will be traveling on the Trans Canada Highway/Highway 1 This scenic drive will take you from gentle foothills to the awe inspiring mountains of the Canadian Rockies. We recommend using SunDog Tours. You can also take train if you’re looking for a slower, scenic option. Weddings in the Banff area are more than just ceremonies in splendid scenery with awe-inspiring mountains in the background, it’s about enjoying a life experience with that special someone. There is nothing like the Canadian Rockies. You’ve picked out the perfect wedding dress – now pick out the perfect spot in which to get married.